Being an informed local citizen means knowing your city: knowing its neighborhoods, its architecture, its natural and its human-made wonders. It makes living in the city a richer experience, and inspires one to become engaged in the public process of creating a city. That’s why this month we are encouraging our readers in the Salt Lake area to get to know their city, whether it’s a consideration of the unique Granary District (see our June 2012 edition), or an appreciation of the modern residential architecture that is as much a part of our unique city as its bungalows and Victorians. On Saturday, June 16, from 10 a.m. to 3 p.m. Salt Lake Modern will feature four private homes on a tour of mid-century modern architecture in the St. Mary’s and Oak Hills neighborhoods. Founded in 2009 as a committee of the Utah Heritage Foundation, Salt Lake Modern documents and raises public awareness about mid-century modern design and architecture in the Salt Lake region. 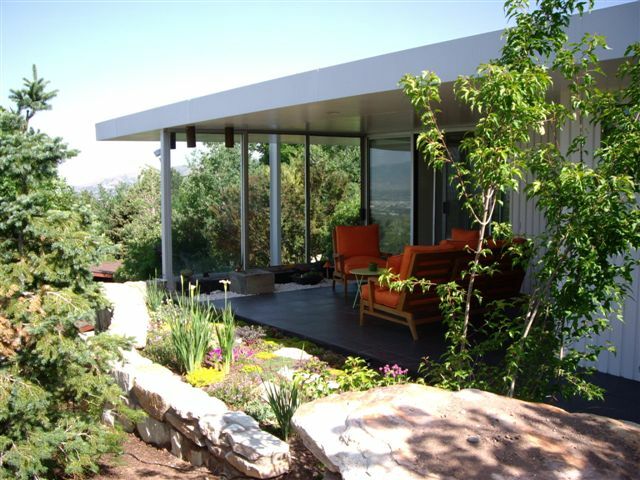 In the past, Salt Lake Modern has featured the work of Utah’s pre-eminent modernist architects such as John Sugden, Ed Dreier, Stephen Macdonald, Ron Molen, and Taylor Woolley. This is the first Salt Lake Modern tour that features different architects in one neighborhood. Two bygone landmarks of the east bench have given their name to the Oak Hills and St. Mary’s neighborhoods. The original land was dominated by St. Mary’s of the Wasatch, a private Catholic women’s college, and later a high school. It housed a convent and was in operation from 1926 until it was demolished in 1972. In 1931, the college was operated by the Sisters of the Holy Cross and was affiliated with Holy Cross Hospital nursing school until nursing degrees were offered by the University of Utah as part of the bachelor’s degree program. Two stone gates served as the entrance to the school and later to the Salt Lake City Golf Course. One of the original stone gates has been incorporated into the architecture of a contemporary private residence. To the north of the St. Mary’s neighborhood is Oak Hills, named after a drive-in theater that was built in 1951 just southeast of Hogle Zoo. Oak Hills Drive-in was located at 2775 E. 1000 South and had a 400-car capacity. At the time few houses were constructed up in the foothills, but the homes to the south had free movies with sound by paying the $50 installation fee for a private speaker connection. The Oak Hills Drive-In and operator Fox Intermountain Theatres received national publicity when the August 1958 issue of Life Magazine published a large color photograph showing Charlton Heston in a scene from “The Ten Commandments” with the lights of Salt Lake City spread out in the valley beyond the screen. With home construction concentrated in the ‘60s and ‘70s, these neighborhoods have a rare collection of modern homes that were designed by Utah’s modern architects including Ed Dreier and Johnny Wallace. Salt Lake Modern has extensively documented Dreier’s work, which includes some prominent designs between the mid-1950s and the mid-1970s. Many Dreier homeowners have mentioned how solidly built their houses are which likely stems from the dedication and attention to detail at each construction site by Dreier himself. Original homeowners that worked with Dreier remember the pleasure of working with a designer who was so thorough yet so personable. Not much is known about Johnny Wallace, but his style looks similar enough to Dreier that it has been mistaken for Dreier’s work. Beyond the glass-and-steel mid-century modern designs, the tour will feature one residence with a more organic aesthetic that has been likened to the influence of late-career designs by Frank Lloyd Wright. You will see how four mid-century era private homes in the neighborhood have adapted for modern living on Salt Lake Modern’s Tour of St. Mary’s. Headquarters for the tour is at 2795 E. Crestview Dr. in front of the LDS meetinghouse. Tickets are $15 in advance at www.slmodern.org and $20 the day of the tour.